In all our previous posts, we've studied the history of rifling in guns. Now we will study some of the manufacturing techniques of rifling. The first method we will study is called Cut Rifling, or more accurately, Single Point Cut Rifling. This is one of the oldest methods of rifling and dates back to the time that rifling was first invented in Nuremberg, Germany in 1520. Cut Rifling consists of removing steel from the inside of a barrel using a cutting tool with a hard point. The cutting tool used is called a "hook cutter". The cutting tool is attached to a cutter box, which contains a mechanism to raise the cutter. The cutter box is cylindrical in shape and is made smaller than the bore of the barrel, so that it may be inserted into the barrel as well. The other end of the cutter box is attached to a hollow steel tube through which coolant fluid (usually oil) is pumped to keep the cutting head cool. As the cutter box is pulled through the barrel, it is also rotated about its axis at a set rate to give the rifling a spiral shaped groove. raising the cutter outwards to increase the depth of the cut. Each time the cutter box is pulled through the length of the barrel, it only removes a very small amount of metal (typically about 0.002 - 0.005 mm or so). Say we wish to cut 3 rifling grooves in the barrel. The cutter is initially positioned so the cutting point is in the far end of barrel and pulled through the barrel and rotated simultaneously to make the first groove. Then the cutter is again pushed back into the barrel and at its starting point, it is rotated 120 degrees (by using an indexing gear to control what angle the cutting starts at) before starting again. Then after the second cut is made, the cutter is again pushed back in, but it is first rotated 240 degrees before starting the cutting operation again. After the 3 initial grooves are made, the cutter is moved back in, but now the cutting depth is increased by 0.002 mm, so when it cuts the first groove again, it will now cut deeper. Again the three grooves are cut, then the cutting depth is increased again by 0.002 mm and then the three grooves are cut and so on, until the desired groove diameter is reached. As you can see, this operation is very tedious and can take a few hours to finish. 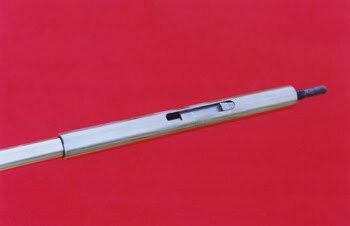 Most of the machines that are commonly used to manufacture this type of rifling date from about the late 19th or early 20th century and quite a few of them are still found in perfect working condition! A majority of the machines used in North America are made by a company that is now very well known for aircraft engines: Pratt & Whitney. It must be noted that even though Pratt & Whitney is now a major aero-engine manufacturer, the founders, Francis Pratt and Amos Whitney, originally met when they were both working in a revolver factory owned by Samuel Colt! The following picture is a P&W Sine bar cutter made in 1895! It is called a sine-bar cutter because a sine-bar is used to control the uniform rotation of the cutter box as it is being pulled through the barrel. These machines have a pulley-and-belt driven mechanism and are made for the smaller workshops of the era. It only weighs about one ton or so and can be mounted to a wooden floor. Thousands of these were made to meet the demand for barrels in World War I and after the war, many of them were sold off for cheap in the second-hand market and ended up in small custom barrelmakers' shops where they are still used to this day. 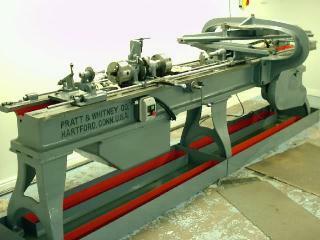 At the end of the 1930's, Pratt and Whitney introduced a heavier hydraulic driven "B-series" of rifling machines. This was basically two machines mounted side by side on a single bed and weighed about 3 tons. Since this was a much heavier machine, it was only suitable for larger factories with concrete floors. These were much more rigid than the sine-bar cutters and more powerful as well. Only a few thousand of these were made and after WW-II, many of these were scrapped since they couldn't be sold as easily as the earlier model. Due to these factors, "B-series" machines are actually rarer these days than the sine-bar cutter machines. of machinery which are mounted parallel to each other. This allows the operator to cut two barrels at the same time. 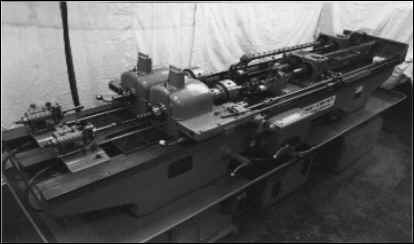 During WW-II, many better methods of making rifling were invented and hence, the B-Series machines were the pinnacle of Cut Rifling technology. However, there are still some custom barrel makers that use these machines to this present day. These makers are usually specialist makers who only make one or two barrels to very exacting specifications. Cut Rifling is slow in nature and is labor intensive. 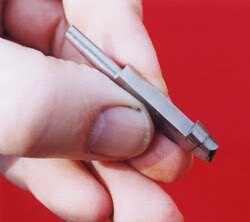 The price of a rifling cutter machine is not very expensive and small shops can afford to buy them. The issue though is that they haven't been manufactured in many years, so finding one for sale is a bit of a problem, as is finding spare parts. Some small shops get around this problem by making their own homemade machines, usually by converting a lathe. Rifling cutter machines also need a high level of technical skill to maintain the tooling (i.e. build new hook cutters, replace cutter boxes etc.). On the other hand, making the tooling is relatively cheap and the tooling is reusable. For instance, the same hook cutter and cutter box can be used to make different barrels all of which have a different number of rifling grooves of differing depths and twists. This makes it very suitable for custom barrel-makers who make only a couple of barrels at a time, to very specific customer requirements. Since custom barrel-makers make their products to very precise specifications, they also charge higher prices for their barrels. The results obtained from Cut Rifling are very accurate: the groove diameter and twist are very uniform and it also doesn't put any stress on the steel. Some other methods of making rifling need the steel to be of a certain quality to work, but Cut Rifling can be used on a wide variety of steel grades with no problems whatsoever. The main disadvantages with this method are that it is not really suitable for mass-production compared to some of the other newer methods of rifling, and that it requires highly-skilled people to operate the machines and make the tooling. We will study more methods of manufacturing rifling in the next few posts.